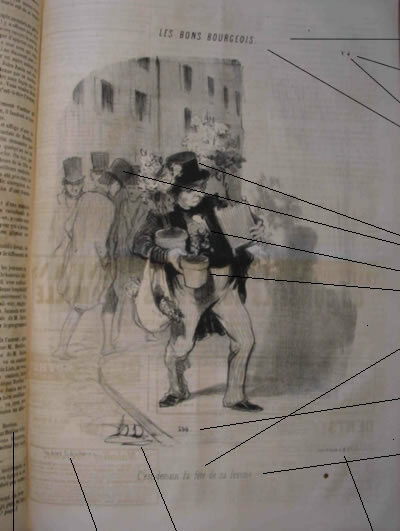 HOW TO USE THE SEARCH FUNCTIONS TO IDENTIFY EACH OF THE OVER 4000 DAUMIER LITHOGRAPHS. Text This is the original French text (caption) shown on the print below the image. Series This is the name of the series, visible above the image (in most cases). Note that one print may have appeared in more than one series. Plate number The prints within a series are often numbered. This number can be seen on the upper right part above the illustration, next to the name of the series. Some prints do not carry plate numbers. Some series are numbered in an irregular way, and some plate numbers within a series may have been used more than once. Stone number This is a number given by Daumier and written directly onto the lithographic stone (it usually appears on the lower part of the lithograph, but not all prints carry a number). It was used for his invoicing to the Charivari. There is no regularity in these numbers and the same number may appear several times. Stands for: DAUMIER REGISTER, which is the digital work catalogue you are looking at. It is the most recent work catalogue. The numbers refer to the numbers in the Daumier Register. All lithographs are numbered between DR 1 and DR 4031. Between DR 3956 and DR 4024 you will find Daumier prints, which had not been previously recorded in the L. Delteil catalogue. These are prints which are either unknown or have not been published before. Between DR 4025 and DR 4031 you will find Daumier prints, which had been registered by L. Delteil as "bis-numbers". All woodcuts are numbered between DR 5001 and DR 6110. Stands for Loys Delteil and refers to the numbers in his work catalogue of 1925. Between DR 3956 and DR 4024 you will find Daumier prints, which had not been previously recorded in the L.Delteil catalogue. These are prints which are either unknown or have not been published before. When searching for appendix prints: for example appendix 37, please insert: app37. HD Stands for Hazard & Delteil and refers to the numbers in their work catalogue of 1904. Publication This is the name of the newspaper or magazine in which a print was published (e.g. Le Charivari). You will also find in this section albums which published certain prints or certain series on paper without print au verso. Publication Date It is the date of publication of a print in a newspaper. In most cases you will find the exact date (Day/Month/Year). But since some papers like the Petit Journal Pour Rire carried no date, we occasionally had to show the publication number of the newspaper, instead of the date. Sometimes we were able only to estimate the publication date. In some cases we could only find approximate dates or just the year of publication. For the albums, we only supply the year of publication. Collections For each print you will see the institution owning this specific print, with indication of the paper quality, state after LD and DR, and where it was possible detailed information about the previous collectors, like Gaston-Dreyfus, Cognacq etc. Collections marked as "Private Collection, nr." may be contacted through us if necessary. One or more photographs are supplied for each print and the provenance of the picture(s) will be mentioned. All information contained in this section has been supplied by the owners of these prints. The Daumier Register cannot be held accountable for any mistakes. Background This section provides multi-level information for each print: a)Description of the series in which the print appeared b)Technical information about new states, specific printing techniques, rarity etc. c)Cultural and historic information about the subject or the specific print. General historic background of the period. d)Explanation of hidden or unclear meanings of the specific print. e)Short abstracts about themes (e.g. about Lawyers, Bluestockings etc.) f)New information will permanently be added and updated. Printer Shows the name, and often name and address, of the printer, who was responsible for printing this specific lithograph, as it appears below the print. Editor Shows name, and often name and address, of the editor/publisher who was responsible for the publication of this specific print, as it appears below the print. Paper quality This describes the medium on which a print was printed: newsprint, wove paper without text on the reverse side, thin paper, china paper etc. States Each print is described by one ore more states. We are showing the states as defined by the HD and LD work catalogues, as well as our own (DR) states. Since we have found numerous new states, not recorded by previous work catalogues, it was necessary to define our own states. Translation This is the original French text (caption) shown on the print below the image translated into English. Lower right, lower left etc. Underneath most prints indications regarding printer, editor etc. are given mentioning name, sometimes addresses. Photographs Each search result will show one or more photographs. The quality of the photographs reflects the quality of the collections ranging between excellent and poor. Collectors will be able to see differences in quality as they appear on the market. The sign of the shopping cart indicates that this print may be available for sale. By clicking on the shopping cart you will be able to ask for a price and details. - Collectors can sell their prints here. CONTACT US for details.If you are interested in buying a print that does not have a shopping cart, ask us and we might be able to find it for you. Update The date shown here indicates when information about this print has last been updated.